A Parliamentary committee has sought public opinion and suggestions on the Lokpal Bill, giving people 15 days to send their feedback about the Government's proposed lokpal bill 2011. Anti-corruption crusader Anna Hazare has set August 30 as the deadline for Parliament to pass the bill, on this government has given this advertisements on the dailies, so that people get to know about the lokpal bill and decide themselves and then send their feedback before 4th september 2011. Soon after the bill was introduced in Lok Sabha on August 4, the Rajya Sabha Chairman has referred it to the Committee and given it three months to give recommendations. The Standing Committee on Law and Justice and Personnel is serviced by the Rajya Sabha secretariat and headed by a Rajya Sabha member-in this case Abhishek Manu Singhvi, and he has decided to get the response of people on the this lokpal bill. Soon after the bill was referred to it, the Committee had invited team Hazare to place its views before the panel. to this Arvind kejriwal, who who was earlier proposing for refferendum now saying, it will be just the waste of time of people and parliamentarians. "We appeared before the Standing Committee earlier and told them that the present bill is actually for promotion of corruption and save the corrupt people," he said. Home Minister P Chidambaram again says that Hazare is free to place his views before the panel once again. the response can be either in english or hindi and has to be addressed to shri KP Singh, Director, Rajya Sabha Secretariat, 201, second floor, Parliament House annexe, New Delhi-110001. 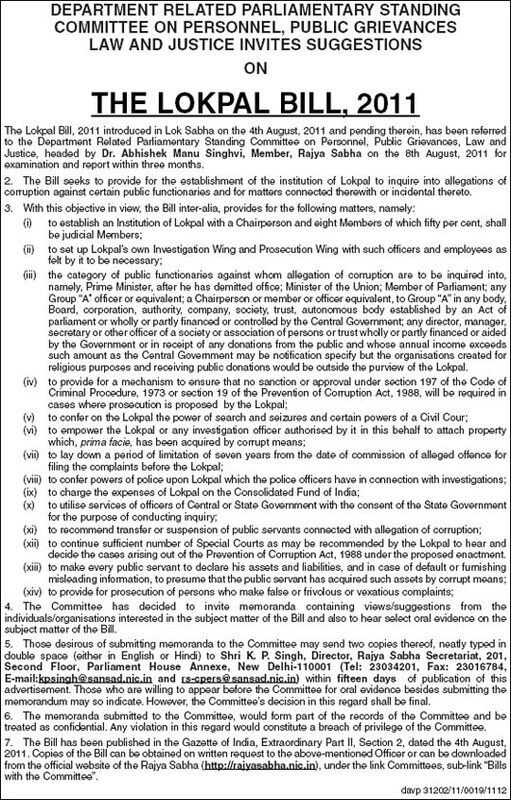 Tel: 23034201, Fax 23016784, E-mail: kpsingh@sansad.nic.in and rs-cpers@sansad.nic.in within 15 days of publication of this advertisement.